From an epidemiologic perspective, retinoblastoma is one of the most interesting childhood tumors to study. Retinoblastoma is a primitive neuroectodermal tumor, and its occurrence in early childhood suggests that incidence can be associated with events affecting development of neuroectodermal tissues during the fetal period. Furthermore, it exists in two genetically distinct forms associated with differing (though not mutually exclusive) clinical presentations (see chapters 3 and 4). This allows the formulation of two distinct, though parallel, mechanisms for disease development. Additionally, there is considerable geographic variation in incidence, suggesting differential genetic susceptibility or environmental exposure(s). The combination of these three factors: a defined and relatively limited temporal window for development; two genetically distinct forms arriving, via different genetic pathways, to essentially identical histologic presentations; and the geographic variation in incidence suggest several handles/angles through which one could examine associations and risk factors for development of this disease. Despite these facts, and due in large part to the rarity of the disease, little is understood about the factors that culminate in the relatively well understood cell cycle and apoptotic pathway defects that define retinoblastoma at a molecular level. 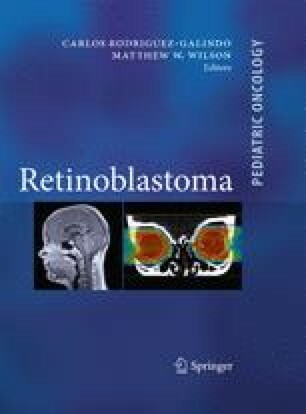 Much has been published regarding the molecular changes that occur during the development of retinoblastoma, and recently, more reports have become available regarding incidence, survival, and treatment in countries outside of northern North America and Europe. Results from these studies point to some potential risk factors underlying disease development; however, few studies have been done to specifically elucidate these factors. Thus, this discussion of the epidemiology of retinoblastoma will, out of necessity, focus on disease incidence and on those few hypo­theses that have been explored using population based study methodology. The author gratefully acknowledges the assistance of Aisha Siebert, MPH, and of Drs M. Veronica Ponce, Arturo Fajardo Gutierrez, A. Krishnakumar, and Desiree Debling, who generously shared data in advance of publication. In addition, the author is appreciative for assistance from Dr M. ­Ramirez Ortiz, and Dr W. Gauss. This work was supported in part by NIH 1 R01 CA98180 and ACS RSG CNE-104953.